Dr. Martens are a counter culture staple. People have been rocking out in their black combat boots since the 60s. More recently, Dr. Martens have seen some more high profile and high cost collaborations that include Raf Simons and Jean Paul Gaultier. But they've also stepped more into the streetwear scene- working with Hong Kong brand Izzue on a total of 3 collaborations so far. This pair is my favorite of the three and were released roughly 7 months ago. They're classic 10-hole boots with a twist. 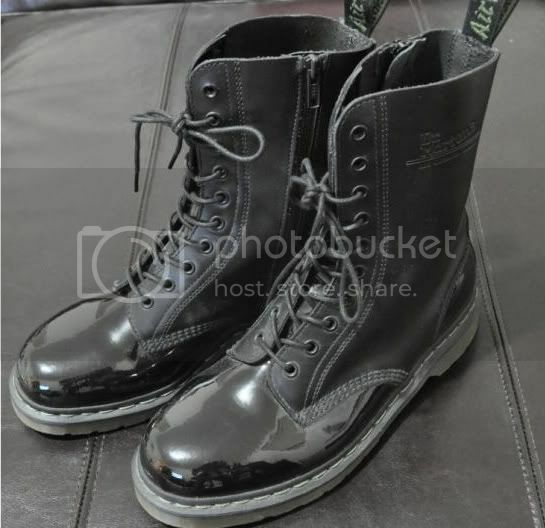 The toe and heel of the boots are patent leather and the upper is regular Dr. Martens leather. Also, a zipper has been added to lessen the hassle of lacing such a high boot. The quality is great but like all Dr. Martens they're heavy. Hey, you were trying to work on your calf muscles anyway right?